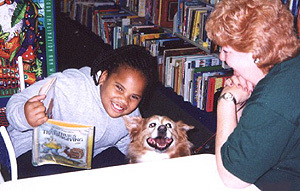 Children's Department 4747 W. Napoleon in Metairie 6:30 p.m. - 7:30 p.m.
4300 South Broad Street in New Orleans 6:00 p.m.
Our literacy project, Reading to Rover, has been tremendously successful. who struggle with reading aloud in a group. to practice their reading aloud skills. or who may not have a pet of their own. It takes an especially calm and quiet pet to work with these children. Parents, click here for more information on Reading to Rover.